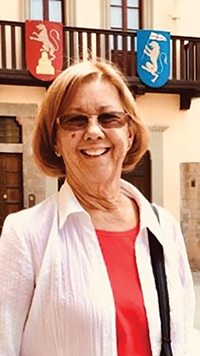 Mary Ellen (Glover) Blakeman, 67, of Merced, Calif. entered the gates of Heaven on Wednesday, Oct. 17, 2018. Mary was born in Visalia, Calif. and was the only child of the late Gwendoylen (Askin) and James Glover. She taught physical education for 39 years at Herbert Hoover Middle School where there is a drinking fountain dedicated in her honor. She taught, coached and impacted the lives of multiple generations of students. She was an active member of the Central Presbyterian Church, loved to have fun and travel the world. She was a source of wisdom and counsel to her children and all who met her. Her greatest joy was her family. Mary is survived by husband Jerry E. Blakeman of Merced; her loving children, Christian Alan (Joanna) Blakeman and their daughter Kaia Annalise of Merced, and Casey Ryan (Leslie Connolly) Blakeman of San Francisco. A Celebration of Life will be held at 3 p.m. on Saturday, Nov. 3 at Central Presbyterian Church at 1920 Canal St. in Merced. In lieu of flowers, donations may be made to Central Presbyterian Church’s Deacon Care Fund by calling (209) 723-0491 or to the Hoover Middle School PE Department by calling (209) 385-6631.